Add oil to dry sugar in bowl. Stir well until sugar is hydrated in oil but still nice and thick. 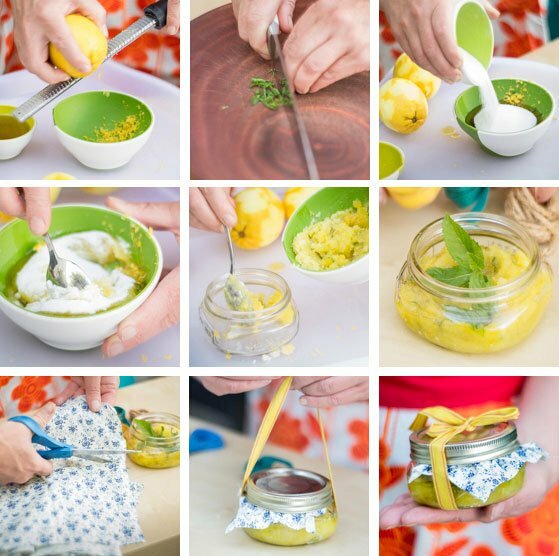 Zest the lemon into mixture. Add mint leaves (optional) and/or 8-12 drops peppermint essential oil (optional). Exfoliate over your body in shower after using soap. Mixture will smooth and moisturize skin while cooling gently! Heavenly “fresh from the garden” aroma. Great as a foot scrub too! HipTip: If only using as a foot scrub, add a little more mint essential oil to really cool off those feet! Essential oil is concentrated so a little goes a long way.